Situated in the foothills of Mount Kilimanjaro, the sleepy town of Moshi provides tourist with a safe and pleasant place to stay in while touring the region or braving Africa's highest mountain. Get in touch with nature at Safaris and Kikuletwa Hotsprings. Spend the 1st (Mon) on two wheels at Ascend Tanzania. And it doesn't end there: see the sights as you ascend with a climbing tour, identify plant and animal life at Wildlife Areas, trek along Origin Trails, and relax and rejuvenate at some of the best spas. For traveler tips, maps, ratings, and more tourist information, refer to the Moshi travel itinerary planner . Dar es Salaam to Moshi is an approximately 2.5-hour combination of flight and taxi. You can also drive; or take a bus. Finish your sightseeing early on the 2nd (Tue) to allow enough time to travel to Kilimanjaro National Park. 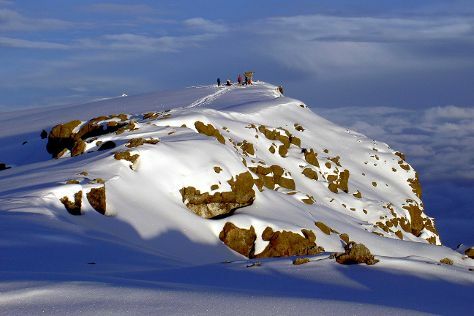 Kick off your visit on the 3rd (Wed): take in the awesome beauty at Mount Kilimanjaro. For ratings, where to stay, traveler tips, and other tourist information, you can read our Kilimanjaro National Park planner . Use the Route module to find suitable travel options from Moshi to Kilimanjaro National Park. Finish your sightseeing early on the 3rd (Wed) so you can travel back home.